CK-12, a great resource for free e-textbook and curricular resources, has just announced the launch of it's Physics Interactive Simulations. The simulations are all online and free. There are currently 66 simulations available, with a lot more coming soon. Some of them may look familiar as some look like some I used on PhET, another source of great online labs and simulations. 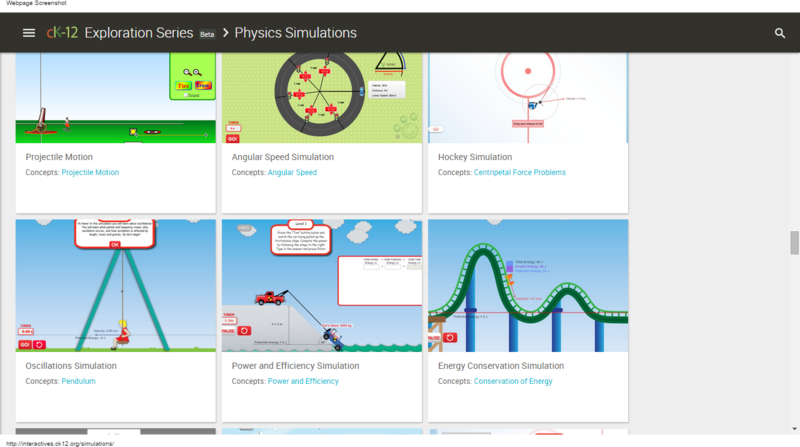 These simulations are great ways for students to learn about physics concepts and can be used as part of labs, projects, or on their own. PhET has same/similar ones with lots of educator resources. You have to sign in to use them, but you can sign in with a Google account so students will have access. The really nice thing - they work on Chromebooks! !